The first season of the hit Showtime series is headed for Blu-ray in December. 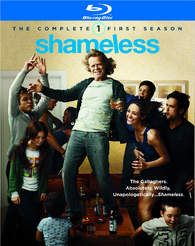 As previously reported, 'Shameless: The Complete First Season' is in the works for Blu-ray, and now the release date is confirmed for December 27. The hit dramedy about an alcoholic father and his six children stars Emmy Rossum, William H. Macy and Ethan Cutkosky and was nominated for a Primetime Emmy for guest actress Joan Cusack's performance. Specs amd supplements have not been set yet, but suggested list price for the 2-disc Blu-ray is $49.99. You can find the latest specs for 'Shameless: The Complete First Season' linked from our Blu-ray Release Schedule, where it's indexed under December 27.